Federal milk order market statistics for .. Issued also online in PDF format. Address as of 7/19/2006: http://www.ams.usda.gov/dyfmos/mib/fmoms.htm; current access available via PURL. Ceased with FMOS-435 (Nov./Dec. 1999). associated butterfat differentials, by markets, are reported on table 2.
average butterfat percentages, and average daily delivery per producer for individual markets are shown on table 4. May, and June are presented on table 13.
pounds, 2.6 percent above such sales in June last year. (whole milk, skim milk items, mixtures, and cream) are reported on table 8. Year :mkts. : over : Of Bf. over :: Bf. : over :total: Bf. : over Of : Bf. : : over Bf. Marketing area July :: Marketing area T.
* Generally the major city in the marketing area. See footnotes on table 2 for location. 1/ Price at 201-210 mile zone, 40 cents less. 2/ Price excludes a 5-cent direct delivery differential. Price at 201-210 mile zone, 24 cents less. ?/ Price excludes an 8-cent direct delivery differential. OR OTHER INDICATED POINT AND BUTTERFAT DIFFERENTIALS, JU-NE* -CON. Major city in the marketing area. ** All averages are weighted. 1/ Boston nearby plant price. Prices at 201-210 mile zone: Class I and blend, 40 cents less; Class II, 5.8 cents less. 2/ June 1970, blend price includes approximately 42.8 cents per hundredweight to nearby and intermediate producers. a 5-cent direct delivery differential. Prices at 201-210 mile zone: Class I and blend, 34 cents less; Class II, 8 cents less. 5/ Philadelphia. 6/ Baltimore. Blend price does not include non-complying handlers. 7/ Charleston-Huntington, West Virginia. (Marquette). 17/ Weighted average of all handlers' blend prices at all locations. 18/ Zone I. 19/ Indianapolis. 20/ Base zone. 21/ Peoria. 22/ Sioux Falls. 2/ Rapid City, South Dakota. 24/ Zone I (Waterloo). dry milk) $4.39. 6/ Wichita Falls, Texas. 37/ Amarillo. 38/ Monroe and Shreveport. 39/ Zone I (Dallas). 0/ Abilene. Class II-A (cheddar cheese) $4.09. 41/ Zone I-New Braunfels, Texas. 42/ Class II-A (cheddar cheese) $4.10. 4/ Mercedes. 44/ Houston. 45/ Denver. 46/ Salt Lake City, Utah. 47/ Grand Junction. 48/ Phoenix. nonpool plant outside the marketing area. 51/ District I (Seattle). 52/ Spokane, Washington. 2/ Portland. TABLE *.--FECE.AL OPDER MINIMUM CLASS I AND BLEND PRICES FOR MILK OF 3.5 PERCENT BUTTERFAT CONTENT, F.O.8. 1I See footnotes on table 2 for location at which price is reported. Minneapolis-St. Paul, Southeastern Minnesota-Northern Iowa, Georgia, and Oregon-Washington. MInneapolis-St. Paul, Southeastern Minnesota-Northern laws. Georgia, and Oregon-Washington. MARKETING AREA JUNE JUNE FROM IN CL1 I JUNE FROM R CL. I1 Mar'-ers under regulation on January 1, 196q, and which have had no significant marketing area expansions. Hinneapolis-St. Paul, Southeastern Minnesota-Northern Iowa, Georgia, and Oregon-Washington. Table 7.--Federal milk order Class I formula price information, June 1970 -Con. 1/ All markets based on Minnesota-Wisconsin price except where indicated. Minnesota-Wisconsin price at 3.5% butterfat exceeds $4.33. 3/ As specified in order. DEFINED BY FEDERAL MILK ORDERS FOR MARKETS WHERE SUCH INFORMATION IS AVAILABLE, HAY 1970 WITH COMPARISONS*-CON. 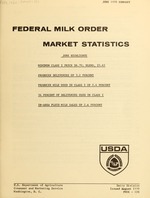 DEFINED BY FEDERAL MILK ORDERS FOR MARKETS WHERE SUCH INFORMATION IS AVAILABLE, MAY 1970 WITH COPARISOEM*..-CO. DEFINED BY FEDERAL MILK ORDERS FOR MARKETS WHERE SUCH INFORMATION IS AVAILABLE, MAY 1970 WITH COMPARISONS*-CON. 1/ Plain, flavored, and fluid equivalent of concentrated. / Plain, fortified, and flavored skim and part skim milk, buttermilk, and cultured specialties. 4/ Sales for marketing area as defined after the 1969 amendment. 5/ Small amount of sales estimated. 1/ See table 8 for markets included. 2/ Includes whole milk equivalent of concentrated milk. / See table 8 for markets included. V Includes whole milk equivalent of concentrated milk. produce manufactured dairy products in regulated pool plants as well as milk diverted and shipped to nonpool plants for processing. Some of the data are partially estimated. See table 8 for markets included. 2/ Includes evaporated and dry whole milk, milk used in candy, soup, bakery products, etc. Dollars er 100 lb. Dollars per 100 lb. I/ See footnotes on table 2 for location at which price is reported. : Dol per 100 lb. :: Dol. per 100 lb. Number : 1000 lb. :: Number : 1000 lb. :: Number : 1000 lb. reported here may not reflect all sales of filled and imitation milks in all order markets. 2/ Unknown. Oregon-Washington, San Antonio, Southern Illinois, Tampa Bay, Tri-State, and Upper Chesapeake Bay. (ndnfat dry milk, spray, Chicago area plant price times 8.2) less 48 cents. * Preliminary. ** Based on partially revised data. 1/ Converted by using Chicago 92-score butter times 0.120. 3/ 3.5% price as reported in the "Fluid Milk and Cream Report," SRS. 4/ "Milk Prices Paid by Creameries and Cheese Plants," SRS. 5/ "Evaporated, Condensed and Dry Milk," SRS. :Cents per 4 gal. :Cents per A gal. ::Cents per j gal. : Cents per 4 lb. Cents per lb. 1/ "Fluid Milk and Cream Report," SRS. Prices are the latest reported to the 10th of each month. Grade and kind of container may differ by markets. 2/ "Retail Food Prices," BLS. 3/ Includes 3-cent delivery charge for first unit of each home delivery. Bil. lb. : Pet. Mil. lb. Pct. : il. lb. Pet. Mil. lb. : Pct. Preliminary. 1/ "Milk Production," SRS. 2/ "Production of Creamery Butter and Cheese,"
SRS. 3/ "Evaporated, Condensed and Dry Milk," SRS. Million pounds : Pct. :: Million pounds Pct. :: Million pounds :Pct. Dry Milk," SRS. 4/ "Summary of Processed Commodities in Store," ASCS. 1.o00 lb. : 1.000 lb. : 1. b. : Mil. lb. Brookfield, and Winchendon). Population (1960 Census) 6,181,643.
plants to not more than 25 percent of a handler's pool receipts during the month. a direct receipt by the nonpool plant. areas from a regulated plant under another Federal order. in the fluid product definition, thereby giving it a Class I classification. standards necessary to obtain pool plant status. to a Class I less surplus price charge. prices in the three orders.